This blog is the third post in a three-part series on Migration and the Catholic Church. The Conference acknowledges this is a controversial and multi-faceted topic. We have included numerous links to provide readers with more in-depth information. One of the most dramatic scenes in the Gospel of Matthew occurs after Herod is informed of Jesus’ birth. The paranoid King, jealous and fearful of a potential rival, orders the murder of all male children under the age of two. 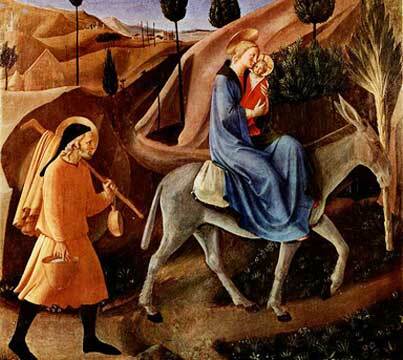 Warned in a dream, Joseph flees with Mary and Jesus down the Roman road to Egypt, where they remain until they can safely return to Nazareth. While we know little about Jesus’ childhood, this incident is an enduring subject in legend and art. We don’t know the exact details but we do know that Jesus personally knew and understood the experience of migrants. Earlier this year, as thousands of child migrants poured across the southern U.S. border, Church leaders recalled the experience of Jesus entering Egypt and how he must have felt as a young Palestinian Jew in a foreign land. In this post, we’ll examine the Church’s response to migration and present a biblical rationale for a compassionate and welcoming response to all who enter foreign lands. Jesus, who studied the Hebrew Scriptures, would have known this commandment from Deuteronomy and understood it in the context of his own sojourn in Egypt. In Matthew 25, he instructs us to look for him in the face of the stranger and says our actions toward them will be remembered at our judgment. Paul also reminds us to welcome the stranger, insisting that in Christ there is “neither Jew nor Greek, slave nor free.” Galatians 3:28. As a Church, we cannot forget to weep and we cannot fail to act. That is why the Vatican, the United States Conference of Catholic Bishops, and the Bishops of Virginia through the Virginia Catholic Conference will continue to advocate for immigrants and for public policies that respect the innate human dignity of all.